This strange little gadget doesn't look much like a synth but can be thought as being one. 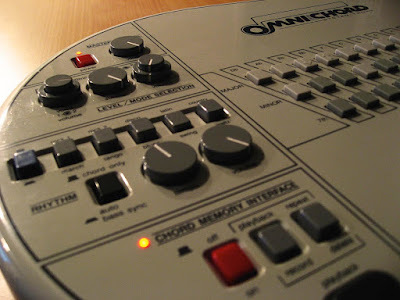 Actually when the first Omnichord model, the OM-27 came out in 1981, Suzuki was praising it to cover all the instruments of the whole band - guitar, bass, organ, piano, drums... This "musicomputer of the future" could provide you with auto accompaniment, beats and walking bass lines, and it was promised that everybody could sound "like a pro" even if one hadn't played ever before. Well, of course that's a bit amusing and one thing's for sure - the Omnichord doesn't sound anything like pro, it's way too lo-fi quality and noisy for that. But nevertheless it makes some cool sounds and is fun and easy to use. 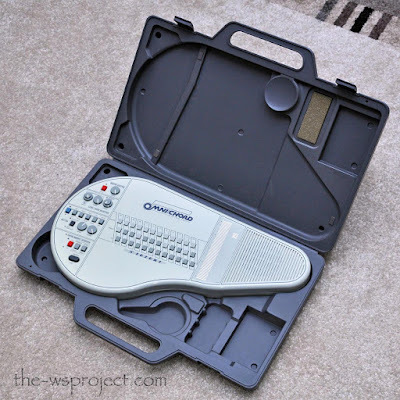 In the eighties we got some omnichords, I think the models were the OM-36 which is like the first model but can produce wider range of chords, and the OM-84 which is the "system two". At least all these three models are analog and that's the reason they are also more interesting. Suzuki made a lesser and more limited version also called a Tronichord, but it seems to be quite rare. Later came also some models with MIDI connections, but the instrument became sample based. 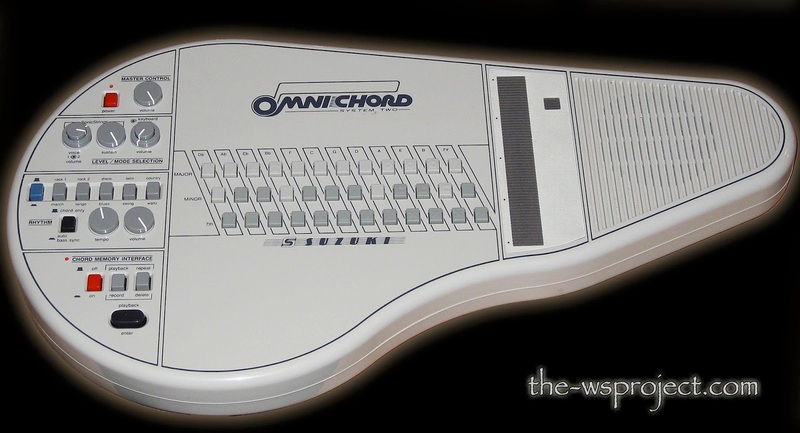 The modern version of the Omichord is called Qchord. Omnichord OM-84 in it's hard case. I recently rediscovered the OM-84 at my parents and took it to my studio for some fun. After all, it makes electronic noises and it's old. That can't be a bad thing! I ended up using it in several pieces, mainly for the albums Enlightenment and Subtle Moves. The Omnichord sounds pretty nice when you run it through some outboard stuff like analog modulation effects and delays. Also some denoising can be handy to get rid of that very hissy output quality. 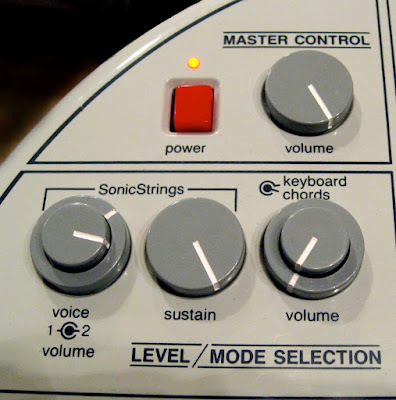 The main sound in the Omnichord must be the "sonic strings". It sounds nice but more unique is the way it's played. There's a ribbon-like touchplate that allows the sound to be strummed like a guitar. In the OM-84 model there are two different sonic strings sounds that can be layered and mixed together. Sounds are quite similar - the brighter basic sound and the other that has a weird tremolo-kind of shimmer to it. 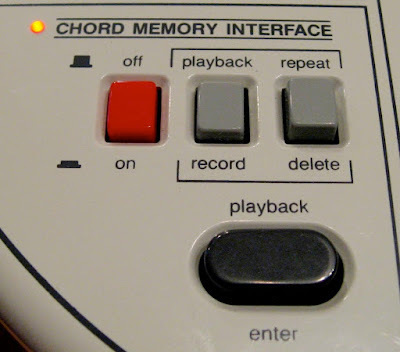 By strumming the touchplate with your finger you can play chord arpeggios in the range of four octaves. You can utilize different playing techniques like using two fingers or only pushing slightly here and there. You can adjust sustain and volume of the sonic strings sound. 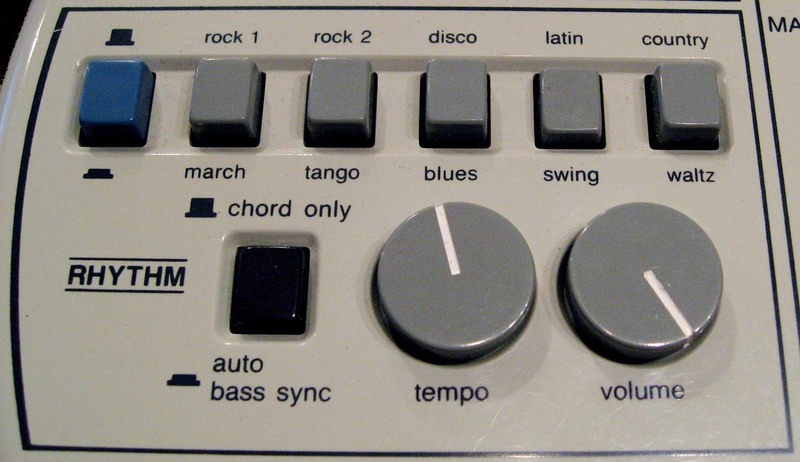 The Omnichord 2 produces many chord types in all keys. You can have major and minor chords with added 7th for both of them when needed, but also augmented and diminished chords are available. You select the chord by pressing the corresponding button or combination of buttons for more special chords. 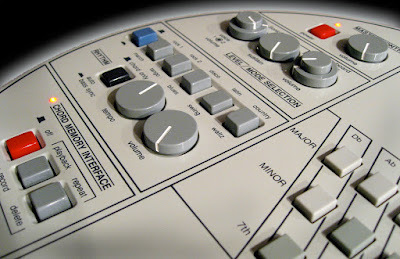 There's also a nice drum machine with ten preset beats. The sound is distinctive but not powerful at all and needs some EQ in my opinion. There are at least bass drum, snare, open and closed hihats and claves sounds. You can adjust tempo and volume of the beats. I think it's just best to sample the sounds and program your own grooves. You can play chords with yet another sound that's probably being the "organ" sound, but I find it pretty annoying and static. Even solo melodies can be played with this sound using buttons (the dark ones) as a keyboard. It's tedious and sounds really crap, not the kind of thing I'd use the Omnichord for. But the automatic accompaniment and bassline uses this sound material to produce complete backings in all ten different styles. If you're a fan of humorous music, please feel free to use these in your next song. Even though the Omnihcord is a bit like a toy, it's still an interesting vintage toy. By processing it with appropriate effects it's sound can surprise positively. And the Omnichord can certainly add some boost in inspiration as it's controlled in an unique way and has many sound capabilities. There are some memory functions that nobody has ever figured out how to use them.